Proposed Changes to Move Tech Shuttles to Dolores St. Nearby residents are upset over proposed changes to move tech shuttle stops from 18th Street to Dolores Street, a move that will remove coveted parking spaces during certain times of the day. 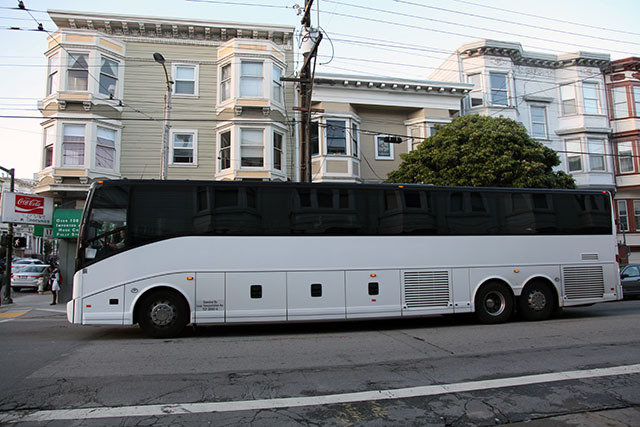 The shuttles – some of which span 35 feet in length – are currently assigned a route that takes them on 18th Street halting at Muni bus stops to load and unload passengers at Church and at Dolores streets in each direction. The shuttle zones, one on each side of Dolores Street, would remove a total of eleven parking spots from 4 a.m. to 8 a.m. and 4 p.m. to 8 p.m. each weekday – four near the entrance of Dolores Park and seven near the intersection of 19th and Dolores streets. Parking will continue to be permitted in these zones when not in use as a shuttle stop. A public hearing regarding the proposed changes will take place on March 18 at 10 a.m. in room 416 at City Hall. If approved by the transit agency’s board on April 19, the new zones could be implemented shortly afterward. The city’s shuttle bus program was implemented in August 2014 to regulate shuttles transporting workers to and from their jobs in Silicon Valley. But under new city policy, which will go into effect on April 1, vehicles of their size will be prohibited from picking up passengers on small neighborhood streets to avoid congestion. “18th Street is not an arterial, so we are looking for alternate locations,” said Paul Rose, the San Francisco Municipal Transportation Agency’s spokesperson. The agency has proposed creating new loading zones on both sides of the block of Dolores Street between 18th and 19th streets. Daniel Milligan lives opposite from one of the shuttle’s current stops on 18th Street and said that although he supports the program, he does not see a benefit in compromising parking spaces by moving the loading zone onto Dolores street. “Dolores isn’t that much bigger than 18th, I don’t know why that justifies creating a new zone and taking away another seven parking spots for that,” said Milligan. Although he has noticed increased congestion on 18th Street as a result of the shuttles, Milligan said he prefers the status quo. “A minor inconvenience of a bit of a back up if a [Muni] bus has to wait at peak time is preferable. It seems drastic to take away seven parking spaces in this area,” he added. Cindy Irons is an 11-year resident of the block of Dolores where the new shuttle zone is proposed, and agrees that having them stop at public bus stops along 18th Street is a better solution. “There is a school right there – you’ve got little kids that are being dropped off. It’s probably not the best area to put a stop,” said Irons, referring to the Children’s Day School at 333 Dolores St., directly across the street from the proposed shuttle loading zone. Former shuttle bus passenger Jack Hebrew defended the transit agency’s proposal and likened the temporary restriction of parking spaces for shuttle buses to the permanent removal of spaces along Fell and Oak streets to make room for bike lanes. You’ve reported on shuttle controversies before. Have you considered pointing out that this opposition is the COMPLETE OPPOSITE of the other opposition? That is, that there are multiple constituencies with opposite demands? Previously using Muni stops was opposed, now it is proposed and removing parking spots for the privileged is opposed. Without pointing that out, it seems like the goal is to make shuttles sound controversial from every direction as opposed to a tradeoff — this proposal is directly the result of previous opposition, so opposition to it simply means there is another side that was previously not covered. That kind of two-faced framing is common in political attacks and is not worthy of the title of journalism. Remember the framing: Obamacare is going to hurt business, but hey, there’s a business exemption — Obamacare is subsidizing its cronies. We can now see that the pilot program has failed. Private corporate busses are a terrible idea, divisive and as evidence points out, unmanageable. Public infrastructure use should not disenfranchise the majority of citizens, to favor a few corporations.